Located in the Balcon al Mar area of Javea, really beautiful villa in perfect condition, recently restored, well situated with a fabulous view of the sea. Wifi internet and air conditioning. Private swimming pool with retractable security cover on request. In total the house has three double bedrooms with 180 cm wide beds, three bathrooms with toilet, capacity for six people. Access to the villa is via a few steps which lead to a first independent studio which opens onto a small garden area with trees, it has a large double bedroom (1 x 180 cm wide bed) with walk-in "Italian style" shower and toilet. A few more steps lead to the main part of the villa which is all on one level and comprises a closed "naia" veranda with beautiful views out to sea, opens onto a spacious living and dining room with red and white sofas, 114 cm satellite television. Modern, very nicely renovated the kitchen, new in 2016, is both light and airy. Two very big double bedrooms, bathroom with toilet and a shower room with walk in "Italian style" shower and toilet. The whole house has air conditioning, it is in perfect order, modern, light. The villa opens onto a garden which is in two parts, separated by a couple of steps, the first with the 10 m x 5 m pool has steps for access and has a child safety system. There is a barbeque and outside shower, six sun loungers, fully set of garden furniture, table and benches for eating breakfast and dinner outdoors. Just below is the lawn area, which is very nice and has a great sea view. 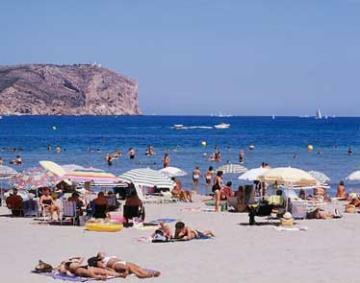 Large sun terrace with a superb 180-degree view of the sea and Javea bay. It is worth noting that both the villa and the garden are south facing. The security deposit of 500 euros - leave with our local agency credit card (non-cashed) or cash. The following services are to be paid on site upon arrival and in cash. Final cleaning: mandatory fee of 90 euros. Air conditioning - 75 euros per week, minimum, and unless otherwise specified, for air-conditioned villas. Optional, to be ordered in advance: Linen: beds made upon arrival plus two hand towels, large and small, tea towels: 12 euros per person per stay. On request: high chair (50 euros per stay), baby bed (50 euros per stay), extra bed if allowed in the villa (80 euros per stay), Internet Key if required (45 euros), pets (50 euros per animal per stay where accepted).